Monster Lab - The Chip's Challenge Wiki - The Chip's Challenge Database that anyone can edit! Monster Lab is the 45th level in Chip's Challenge 1. It is one of the game's most famous in expert circles for its display of mechanics, trivia nuggets and many possible solutions, the most notorious being the bold solution. Such route is officially named the suicide run, with this term applied to similar solutions in other levels - notably, a very close relation in CCLP3. Monster Lab's bold route, on top, is almost certainly highest on the wanted bold hitlist of anyone without it. It requires Chip to simply walk through the storm of walkers at the very start, and the chances of success are well over 1,000 to 1 against, taking anywhere from 45 minutes to almost an entire day of consistent work to collect. For this reason, Fullsec is, for all practical purposes, mandatory in MS CC. With little to no skill involved, the best way to attempt the 292 route is to simply reserve a full day in advance, with something in the background to avoid boredom. While there are 291 and 290 routes that are slightly easier, it is recommended that the 292 be attempted directly to eliminate it for good. The one skill tip is to use a slightly different 292.0 route as opposed to the 292.2 route shown in the first 292 AVI: instead of moving RL after pushing the cloned block, move 2L 2D onto one of the other green buttons. This is generally believed to be more likely to work, though such corrections are difficult to make for obvious reasons. 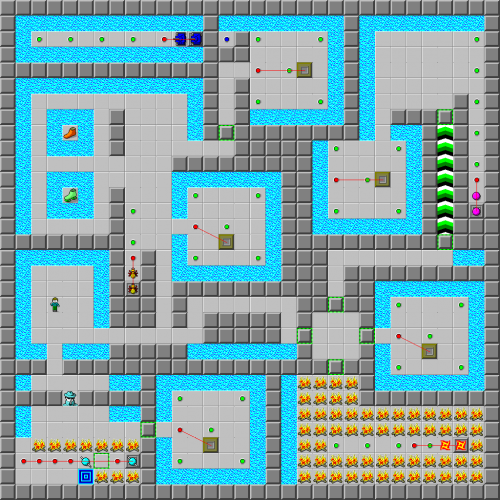 This level was designed such that all the other clone machines had to stop completely, but instead some can be left on and synchronized with each other, so that all their green button presses cancel and leave the walls alone until Chip attempts to exit; though the walls will then be sent out of order again, the walkers change nothing about the toggling sequence and the luck input is minimal. This solution is guaranteed, but the 226 is not, though still much less uncertain than the 292. The order is that of the bugs (push a block between the fire boots and suction boots), then tanks (hit the blue button twice, waiting  in between presses), then collect the fire boots (the suction boots are unnecessary), and finally block the fireballs (the pink balls need no help), leaving the walls paralyzed. Lower routes than this are available and are more permissive, but this is the official no boost route, as the pink ball room has its own dangers if not carefully handled. If Chip attempts to run straight out after trapping the pink balls, the toggle walls can cease to switch while Chip is in between them and permanently trap him inside. A secret solution is also built into Lynx: Chip can use block slapping to push a block over the fire in the exit room, halting the walker cloning. This can result in a score as high as 286, which is the maximum score for Monster Lab in Lynx; the higher scoring routes are impossible due to Lynx walker mechanics, including their ability to attempt moves into acting walls. Monster Lab's record history contains the largest single timed improvement in all of CC1, with a recorded increase from 245 to 290. The tank section contains the first use of the Frankenstein Glitch in official Chip's Challenge play: the blue button is hit on the same turn that a tank is cloned. This variation of the glitch exists in Lynx, and was replicated for MS CC and Tile World. Level 58 in DrewT1.dat (by Drew Thomas) is entitled Monster Lab: Suicide Run - identical except that the time limit is now 11, forcing the titular maneuver. This page was last edited on 14 March 2019, at 23:11.